It’s been 11 years in the making, but work is finally under way at Panattoni Park Northampton, which on completion will provide 1.6m sq ft of new industrial space in the golden triangle. 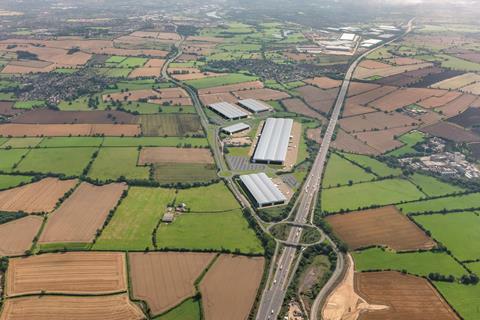 Panattoni is the UK’s largest speculative builder, with more than 3m sq ft of new space in development, and is creating three speculative units off junction 16 of the M1 as well as bringing forward two build-to-suit opportunities. The first phase of speculative development will be available from Q4 2019 and will consist of three units of 93,000 sq ft, 222,000 sq ft and 310,000 sq ft. Panattoni has taken advantage of the recent good weather to get the build in motion. The infrastructure work and earthworks for the initial buildings are well advanced. Oliver Bertram, development director at Panattoni, reports that there has already been strong interest from its customer base in both the speculative and build-to-suit opportunities, which come in at 260,000 sq ft and 780,000 sq ft, and says the developer hopes to convert initial interest into firm commitments over the coming months. The site, originally in the possession of six different landowners, was assembled by Northampton developer Hampton Brook in 2007 before going through the south Northamptonshire local plan process. A number of parties approached Hampton Brook with offers for the site before Panattoni bought it in 2017. The scheme gained outline planning permission in September 2016, with reserved matters consent being secured in May this year. When complete, the £200m project will provide upwards of 2,000 new jobs and is likely to be attractive to the fast-growing ecommerce and logistics market, Panattoni says. James Harrison, director at Burbage Realty, which along with Savills is acting as leasing agent for Panattoni Park Northampton, says he is confident that the development will attract strong occupier interest. Harrison notes that the park is one of only a few sites in the golden triangle that can accommodate buildings with large footprints. Junction 16, meanwhile, is one of the only undeveloped junctions on the northern stretch of the M1 between junctions 11 and 20. “There’s nothing else that will come in the next 10 to 20 years,” says Harrison. The site’s proximity to the motorway is set to be a key selling point. “From an occupier’s point of view it’s excellent because you’re right outside Northampton,” says Harrison. “And from the A4500, which hardly carries any traffic, you’re immediately on to the motorway.” Two new roundabouts are being put into the A4500 as part of the project with work due to start in 2019. Harrison describes the speculative units as being of an “institutional-plus specification”. The two smaller buildings will have a 12.5-metre clear height, while the larger unit will have a 15-metre clear height. “They’ve got good provisions of electricity which seems to be all-important to occupiers at the moment,” Harrison adds. Now that construction is under way, Harrison expects the project to move “full steam ahead” with Panattoni confident of delivering the speculative buildings toward the end of 2019. The location in the golden triangle means future occupiers will have easy access to the East and West Midlands, while the central location makes a diversity of ports and airports accessible – a key consideration for businesses making Brexit contingency plans to keep supply chains moving. Travel time is just over one and a half hours to London and around four hours to the ports at Hull, Southampton and Dover, while 75% of the UK population is within a two-hour drive. Northampton also offers a readily available, skilled workforce. Almost 715,000 people of working age live within a 45-minute drive-to-work time, while more than 45,000 people work in logistics in Northamptonshire. Indeed, the proportion of the workforce employed in logistics in the county is twice the national average, giving Panattoni Park Northampton access to a suitably skilled labour pool. The development will ultimately create 2,000 new jobs and as such it has received “excellent local support”, adds Harrison. 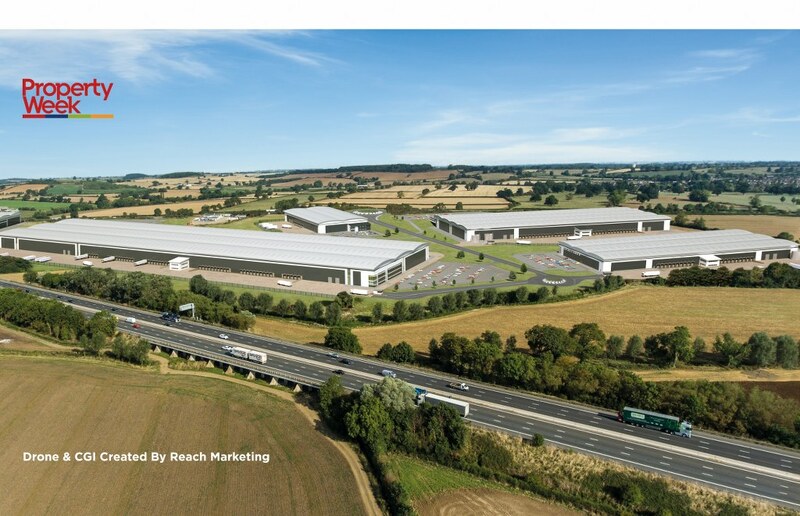 The East Midlands industrial market as a whole remains strong. Savills’ latest Big Sheds report from July notes that the occupational market in the area continues to set records with 4.01m sq ft of space transacted at the half-year point. This comes in just 200,000 sq ft shy of the total amount of space transacted in 2017 and 146% higher than the long-term first-half average. It also represents the highest amount ever for a first half of the year. With 2.35m sq ft being built across nine units, which have an average size of 261,000 sq ft, developers are betting on the market remaining buoyant into 2019 and beyond. The picture for rental growth is similarly positive. Savills notes a number of developers are quoting £6.75/sq ft to £6.95/sq ft on units under 200,000 sq ft and expects to see strong rental growth in the region, especially given the lack of smaller units. Panattoni is not yet quoting rents for the speculative units at its Northampton development but Harrison says that if it was marketing the building today they would be in the £6.50/sq ft to £6.75/sq ft range. With development opportunities along the M1 corridor at a premium and take-up buoyant, Panattoni’s confidence in its new venture appears to be built on solid foundations.